An alternative eclipse editor plugin for the SalesForce.com Apex language. 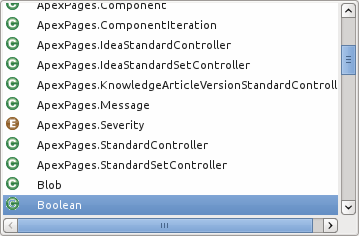 Compared to the Force.com IDE editor, LS's content assist generally gives more proposals and is less sensitive to errors in the project. The proposals are sorted by declaration proximity - variables, fields, other classes. Apex system classes are included with correct case. When a function is selected for completion, the cursor is placed inside the parentheses when the function expects parameters, and after the parentheses when the function has no parameters. 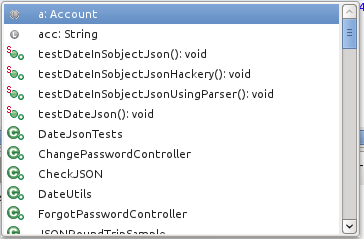 Objects and object fields are supported in proposals as of version 1.0.6. The outline view is sortable by declaration order and alphabetically. Open the quick outline view using ctrl+o. Filter entries using camel-case matching and select symbol using up/down keys. Hit F3 while the cursor is on a variable, field, method or class and you will be taken to that symbol's declaration. Place cursor on any Apex variable, field, property, method or class. All occurrences of that symbol will be highlighted in the file. Toggle this feature with the highlighter button in the toolbar. Contextual syntax coloring - soql and sosl statements' keywords as colored as keywords only inside query statements. Auto closing of apostrophes, brackets, braces, angle brackets and parentheses. Auto move semicolon and open brace to end of line.